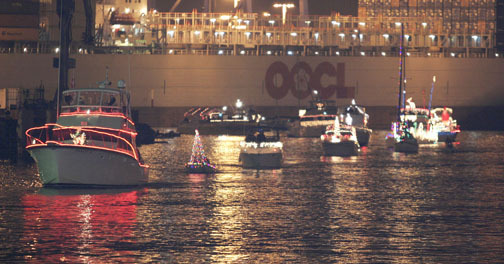 SAN PEDRO, Calif. — October 26, 2010 —Bundle up your family and friends and head to the waterfront on Saturday, December 4, for the 48th Annual Los Angeles Harbor Holiday Afloat Parade, starting at 6 p.m. in the Port of Los Angeles Main Channel. LA-LB Sector, USCG Captain of the Port Roger Laferriere will preside as Grand Marshal for this year's sparkling spectacular of boats decorated in holiday themes. With the theme of "Peace on Earth," officials and community leaders will take part in the parade as judges or passengers on approximately 50 parade boats. Vessels of all shapes and sizes will participate, including powerboats, sailboats, tall ships and harbor working craft. The parade, which is sponsored by the Port of Los Angeles, starts in the East Basin near Banning's Landing Community Center in Wilmington and takes approximately 90 minutes to cover the entire parade route up the Port's Main Channel. Spectators may view the procession from several points along the Port's Main Channel, including the Banning's Landing Community Center, 100 E. Water Street, Wilmington; the Los Angeles Maritime Museum, 600 Sampson Way, San Pedro; Ports O' Call Village, 1100 Nagoya Way, San Pedro; the Cruise Ship Promenade at Harbor Boulevard and Swinford Street in San Pedro; 22nd Street Landing, 141 W. 22nd Street, San Pedro; and Cabrillo Marina, 200 Whaler's Walk, San Pedro. Viewers are invited to enjoy festive pre-parade events beginning at 3 p.m. at Banning's Landing Community Center and post-parade Fanfare Fountain holiday program at 8 p.m. at the entrance to the World Cruise Center in San Pedro. Boater registration for the event is now underway. Vessel entry fee for the parade is only $30, which includes one admission to the Parade Awards Brunch on Sunday, December 5, at the Los Angeles Yacht Club. Advance tickets for the Awards Brunch are $20 or $25 at the door. Trophies will be awarded in the following categories: Theme, Traditional, Humorous, Holiday Spirit, Best Animation, Commercial, Most Original, Children's Choice, Judge's Choice, and Grand Marshal's Award. Yacht Clubs will be vying for the coveted Perpetual Trophy, awarded to the club with the most entries. Deadline for boat entries is Friday, December 3rd. To enter, contact parade committee members: Bob Paulson, San Pedro Yacht Club, (714) 342-3864; Terry Brown, Los Angeles Yacht Club, (323) 461-3566 or Trisha Jackson, Long Beach Singles Yacht Club, (562) 201-4898. For parade sponsorship information or Awards Brunch tickets, contact Donna Ethington at (310) 549-8111.